Versatile and sleek, our Visofold 1000 aluminium bi-fold doors are the perfect addition to any room, helping to transform living areas into bright and airy spaces. 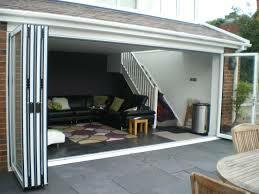 Our tailored bi-folding doors can help create an elegance adding value to your house. Visofold bi-folds contain Polyamide thermal barrier technology to help keep rooms warm in the winter, subsequently reducing energy bills. In addition, a number of threshold options are also available to give further-improved weather performance. High security multi-point locking mechanisms are fitted on opening sashes, with shoot-bolt locking and internally glazed sealed units for added assurance. This attention to detail when it comes to your security is always reassuring to know. Available in any RAL or British Standard colour, Visofold bi-fold doors are polyester powder-coated for durability to maintain a fresh appearance, year after year. A dual colour option allows you to choose different shades for the interior and exterior whilst an option for realistic wood and metallic finishes can add that final touch of personalisation. 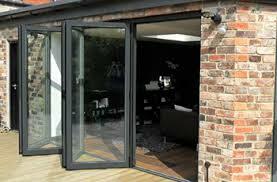 With an aluminium profile that is designed to be strong and durable, you can be sure the Visofold bi-fold door will deliver a reliable performance as well as being pleasing to the eye.